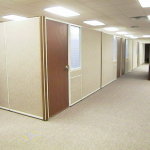 These small office partitions are installed at individual workstations to provide boundaries at a granular level. They may be permanently mounted, but more modular and mobile solutions are also popular. These include freestanding cubicle panels and desk mounted privacy panels. They come in the same type of materials as movable walls to match or complement the existing interior design theme of an office space. Break up the open office landscape. Employees really do need choices between collaborative space and “heads down” work space. Movable walls can create hubs for dynamic teaming interaction. Desk top or freestanding panels create workstations that promote uninterrupted concentration. Attract and retain top talent. This is a low cost way to offer senior employees an individual office space (rather than just a bigger cubicle) as part of their total compensation package. Despite the “flattened hierarchy” in many of today’s work environments, a private office is still viewed as a substantial perk. Align with privacy regulations for greater compliance when dealing with sensitive information. Healthcare is an obvious use case, but HR and Accounting are departments in most organizations that can benefit from greater privacy. Brand a business with colors, materials or even custom printed office partitions. This is especially important for organizations that are moving into a space that was previously owned by another company.